Visiting pumpkin patches, carving jack-o’-lanterns, and telling scary stories. Dressing up in masks and costiumes, going to parties, and trick-or-treating for candy. These are just some of the traditions that make Halloween one of the most anticipated holidays of the year for many children – and for lots of grown-ups, too! Explore this fun holiday, which began as a festival in ancient Ireland and Britain and is now celebrated in a number of countries around the world. Readers will learn why ghosts and skeletons and other creepy creatures are associated with Halloween, and also about the origins of such Halloween customs as wearing masks and trick-or-treating. And they will enjoy seeing how people living in various countries celebrate Halloween. Boo! 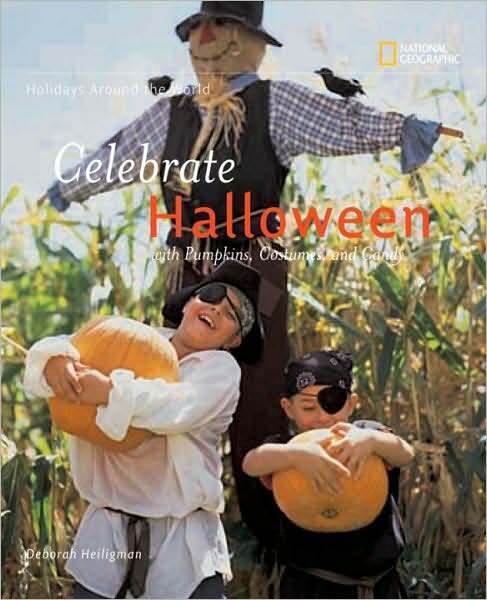 “The real scoop on Halloween is offered in Celebrate Halloween, by Deborah Heiligman (National Geographic Society, 32 pages, $15.95), part of the publisher’s Holidays Around the World series. In exquisite colored photos and a short text, peppered with appealing facts, the background of and current trends on all things Halloween will enlighten readers 6-12.